Most drummers can talk at length about the art of working within a rhythm section. 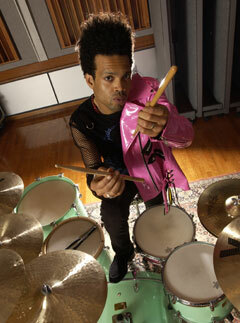 But few do so as authoritatively as Charley Drayton, who boasts extensive credits as both a drummer and a bassist. Drayton's long and eclectic list of credits includes such names as Herbie Hancock, Keith Richards, Johnny Cash, Chaka Khan, Mariah Carey, Michelle Branch, Seal, Iggy Pop, Neil Young, Janet Jackson, Courtney Love, and many others. Drayton was born to a musical family in Brooklyn, New York. His bassist grandfather, Charlie Drayton, played with jazz greats Billie Holiday, Lena Horne, Ben Webster, and Louis Jordan. And Charley's father, Bernard, is a successful jingle and record producer. Charley spent much of his childhood hanging out at his dad's sessions, witnessing New York's top session cats practicing their craft. With these drums, producing the colors I want is effortless. I trust them completely. We recently spoke to Charley about his unique groove perspective- from both sides of the rhythm section. Drums-I started playing at age two. But by the time I was ten or so, I realized I could no longer play everything I heard in my head and needed another instrument to get the sound out. But what really got me into the bass was hearing Will Lee on a Brecker Brothers album and then meeting him at one of my dad's sessions. Since the drums were set up, I played with him between takes. We became friends, and he even gave me one of his basses when I was twelve. How did working with a great bass player shape your drumming? 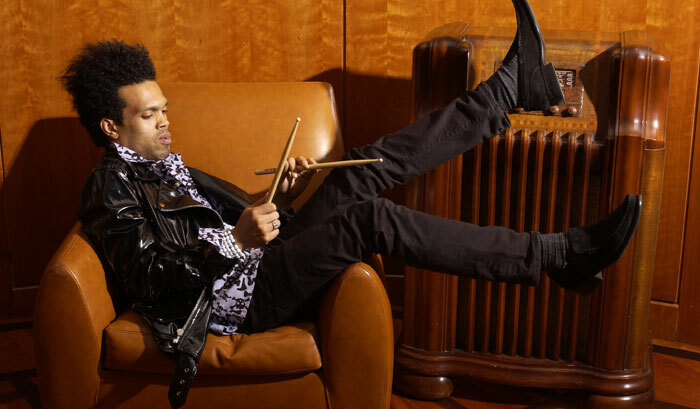 Will is so efficient and smooth that he can make drummers sound more solid than they are. For example, he never made my timekeeping an issue-he just found a way to make it feel good. But one day I went to a gig where Bernard Purdie was playing drums, and Chuck Rainey was on bass. Bernard made me sit in. And playing with Chuck changed my life. Will had been accommodating me, but Chuck was more forceful. He lifted me. It was the most effortless groove levitation I'd ever experienced. And right then I knew what I had to do to get it together as a drummer. The physicality of it, the whole dance of playing the drums-everything became clearer. I started to listen more, play less drums, and play more music. Tell us about your tastes in drum tones. I've always been a traditionalist. I gravitate toward warm sounds. When I need a brighter tone, I try to generate it through my attack. That's why I change heads as infrequently as possible. My usual kit is a wintergreen-sparkle Yamaha Stage Custom. It's a lighter-weight kit that's actually on the lower-end of Yamaha's price spectrum, but it really suits my playing. I like to get a snap out of the drums, as opposed to pounding, and those lighter mahoganyand- birch drums help me do that. With these drums, producing the colors I want is effortless. I trust them completely. Do you use any other kits? I also have a ten-year-old Yamaha Maple Custom kit, but I've always been a little reluctant to take it out, because it's so beautiful! It's pink flake-my custom color. But I've decided I'm finally going to start breaking them in and taking them to the studio. I want to match them up against my Stage Customs. You're known as a feel player, but like most session musicians, you're often called upon to overdub live drums over sequenced tracks. Well, for me it's always the most honest and true when you play together with humans in the room. That's where you can best set the tone with your spirit and bring the music to life. But there's an art to playing with machines, too, and I've learned how to melt myself into those situations. A lot of the preparation is mental. I try to visualize the mechanics of playing the part before I actually try it. That includes the actual drums I'll play, the part, the feel-everything I'm going to add to feed the music. Even when you're not behind the kit, you can listen and feel the physical motions your body will need to create your part. What advice do you have for young drummers on playing well with others? Be a musician first. Practicing is important, but remember that a lot of what you practice may have little to do with what happens when you play with other musicians. Also, listen to anything and everything. Sometimes musicians focus too much on what they don't like, but those can be the things that teach you the most. Not everything has to be your cup of tea, but if you're there to share the message of music, the possibilities should be endless.